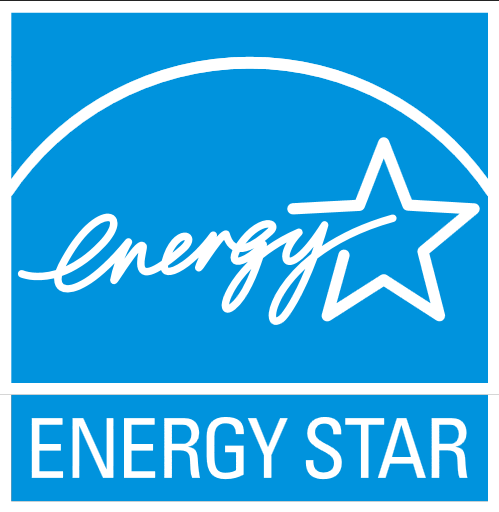 When an appliance requires less than the rated output of a fuel-driven generator, the generator wastes fuel, as it will continue to convert the energy of the fuel into usable electricity, even when electricity is not being used. For example, if a 3000-watt fuel-driven generator is the sole source of power in a closed circuit, it must run continuously, producing 3000 watts of energy whether the load is 3 watts or 3000 watts. Power produced in excess of what is required by the load is lost. This is a classic example of a low-efficiency circuit. However, when a battery is used as the primary source of energy for a load, power flows from it only in direct proportion to the power that is required to support the load. This turns the entire circuit into a high-efficiency model. Adding a battery to a portable power system makes it a hybrid power system. 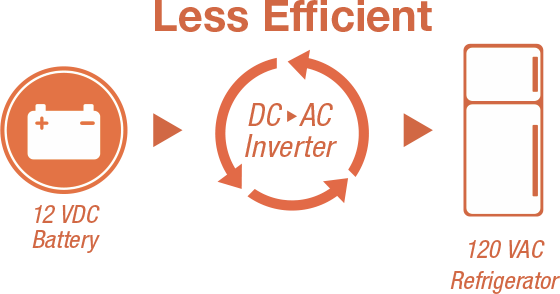 The hybrid power system is a paradigm shift that catapults a low-efficiency closed-loop circuit into a high-efficiency system. Appliance efficiency is also known as load efficiency. As appliances consume less power, power source requirements also change. When designing a portable power system, purchasing highly efficient components can provide many benefits. Appliance loads can often be matched to the electrical characteristics of the circuit. This will increase the system’s overall efficiency by allowing direct connection to the circuit without the need for additional power management devices to aid in the function. The fewer management components used in a system, the more efficiently it will operate. For example, components such as inverters, converters, or similar devices used in a circuit to “adapt” appliances for use in a particular electrical circuit themselves require power to operate, and thus the total power required to operate the appliance is increased. 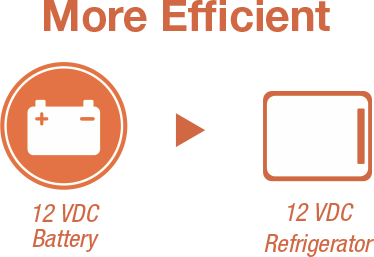 For example, a 12-volt direct current (DC) electrical circuit powered by a 12 V battery can directly support a refrigerator that also operates at 12 VDC. This setup will transfer power through the circuit more efficiently than if the refrigerator requires 120 V alternating current (AC) power. In the latter example, an inverter would be required. It is prudent to shop around when looking for appliances because power consumption varies among models even within a particular appliance class. Purchasing an energy-efficient device can be more expensive up front, but could mean future savings in energy costs as well as a flexibility of use that makes the device compatible with a variety of portable power sources. When purchasing an electrical appliance, remember to ask if a 12 VDC adapter is available for the product.  A hybrid power system utilizes a bank of batteries to capture all of the energy produced by the power generation source (fuel-driven generator, solar, wind). Batteries and fuel-driven generators are natural complements to one another. It immediately increases the efficiency of the entire circuit. It opens the architecture of the circuit to allow for the use of multiple power generation sources (including traditional and renewable) and technologies that directly support the application. It provides for multiple levels of control to be implemented, allowing the operator to establish operation protocols based on specific requirements for the application. Installing a battery in a system relegates a fuel-driven generator to a support role (recharging) for a battery bank, allowing it to be used only when the battery state of charge (SOC) is low. This reduces runtime, maintenance, and fuel consumption. Installing a battery in the system provides power stability and security (continuity of operations) in the event of a generator shutdown because the batteries serve as an uninterruptible power supply (UPS), bridging the gap when generators are shut down due to failure, maintenance, refueling, or upgrade.  The return on investment (ROI) of hybrid power systems in the field is difficult to determine because the cost of fuel cannot be calculated in dollars per gallon alone. 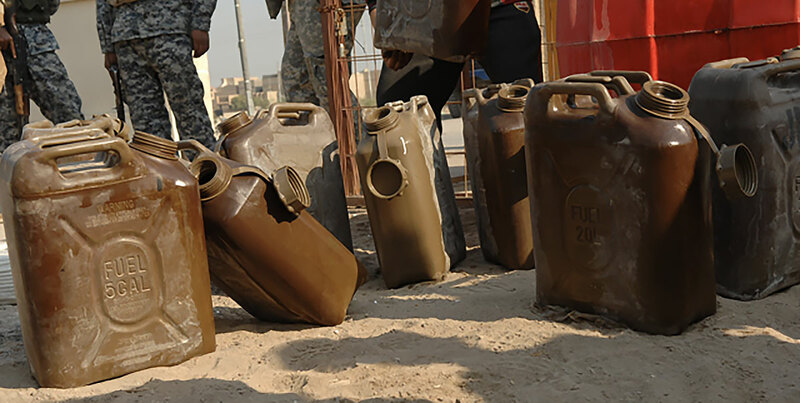 Fuel supply, storage, transport, and equipment maintenance require consideration to calculate the actual cost of using a portable fuel-driven generator. This is the fully burdened cost of fuel (FBCF). 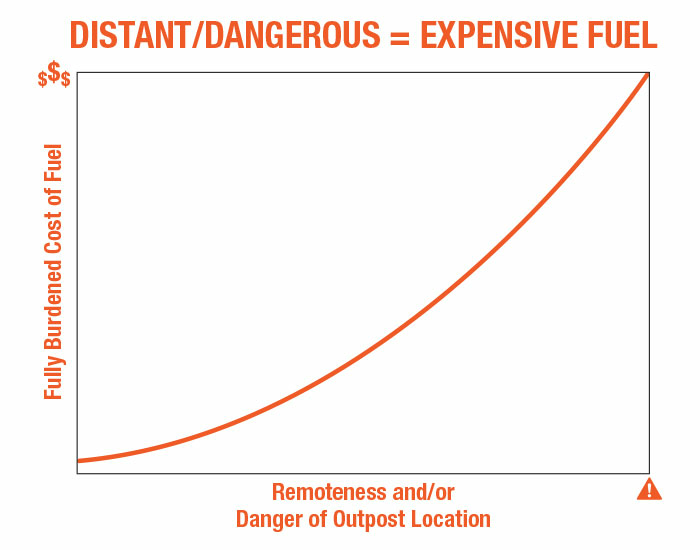 The chart shows the FBCF to a military outpost can increase dramatically if the outpost is located in a remote and/or dangerous area. For example, a surveillance outpost located on a mountaintop far away from the supply depot might require a helicopter to transport fuel and supplies. This outpost’s FBCF would be considerably higher than a similar outpost closer to the supply depot. In general, the ROI of a hybrid power system is realized in a much shorter time if the system is to be deployed in remote or dangerous locations. Even using alternative liquid fuels, like those used in fuel cells, has little benefit on reducing the FBCF because the real cost of using any liquid fuel is in the logistics of supplying and transporting the fuel. For most applications requiring portable power, a battery-based, hybrid system employing renewable power generation sources can reduce dependence on traditional liquid fuels. This alleviates some of the logistical costs associated with traditional portable power generation. A portable Solar Stik Hybrid Power System is a significant investment. However, a high-efficiency system often pays for itself over time due to a reduction in logistical burdens (fuel transport) and increased autonomy (fewer personnel required for continuous operation). As with any portable hybrid power system there are ongoing operational expenses—adding renewable power generation sources doesn’t mean free power, and batteries are consumable and require replacement. Maximizing the efficiency of the system and harvesting as much energy as possible from renewable sources (e.g., solar or wind) are critical components to consider when designing a system.